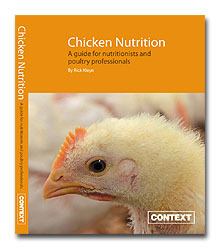 This is the most up to date, complete and practical guide to chicken nutrition that you can buy. It covers the underlying theory of poultry nutrition making it easier to recognise problems in the field. As the most important aspects of the diet are those that make up the largest proportion of the costs, this book focuses on these areas eg. energy protein and key minerals. Rick Kleyn is a consulting nutritionist, most active in Europe and Africa. For some time Rick has undertaken a training seminar in poultry nutrition and this represents material that has evolved over 15 years of development. To find out more about this book, please view the sample pages. This book represents material for this course that has evolved over 15 years of development. Rick Kleyn is a consulting nutritionist most active in Africa but also spends time in most countries in Europe and so his wealth of practical world-wide knowledge is reflected in this book.